Affiliated Resources Group (ARG) specializes in housing and real estate development. By coordinating the missions of its affiliated companies, ARG works to maximize opportunities for economic growth and development to enhance lives through programs that expand economic opportunities for individuals and their families. ARG affiliates develop and manage housing, administer large government programs and provide consulting services to facilitate operational and programmatic sustainability. ARG’s 2017 Year in Review provides both an overview of our Agency’s strategic direction and the focus of ARG’s Affiliated Companies. 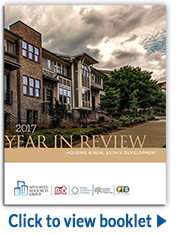 The report highlights the accomplishments of each division as well as the impact we are making to enhance lives through affordable housing and programs that help our clients achieve economic stability. Working together to provide a full range of services.